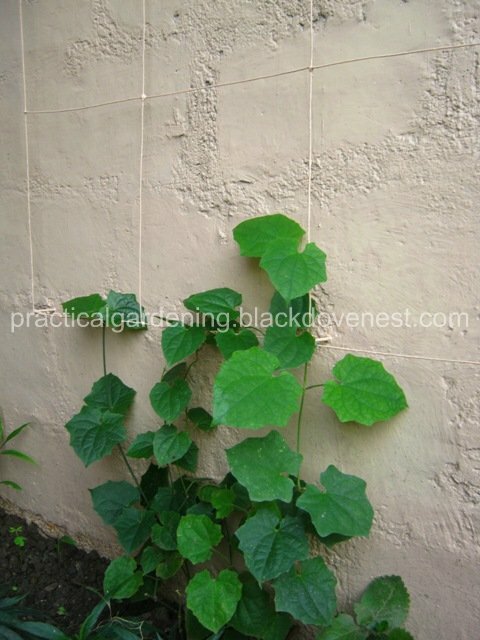 In a recent post, I discussed a flourishing T.grandiflora vine that I trained in a garden pot with a built-in bamboo trellis. This vine was from a group of seven very young vines or saplings that my wife and I saw by the roadside. This is at a college campus where we went to find seedlings of the T.grandiflora. We were a bit skeptical yet very much hopeful in growing this lovely Thunbergia grandiflora vine. From the seven young saplings, here's the biggest and healthiest-looking that I separated to grow on the trellis. It's sitting on the catch basin's concrete cover in the middle of our front lawn. The photo was taken right before I replanted it in the newly built trellis. Fortunately, it thrived and bloomed on its new trellis. The rest of the vine saplings survived and had no trouble growing, albeit more slowly. After a couple of months, I realized I had more vines than I wanted. I have to admit that giving away several of these vines did cross my mind. This is especially so when you realize how big and aggressive the T.grandiflora can be. My wife wanted to keep them all, however. So left with six healthy looking young vines that were still in thin plastic bags, I had to find a permanent home for them. Fortunately, this situation also gave me an opportunity to learn more about the growing and flowering habits of the Thunbergia grandiflora. I knew the vine can become vigorous when left on its own, without pruning. Once established, it doesn't need plenty of care to grow. 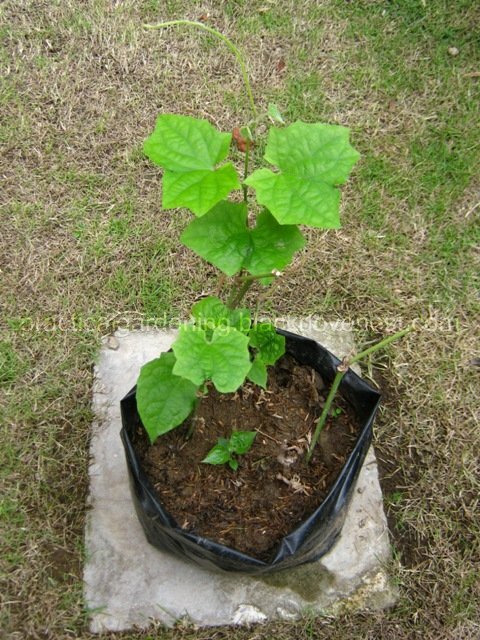 I already have a T.grandiflora vine in a garden pot with a tall trellis. But is it possible to have a heavy flowering vine without all the thick foliage? Is it possible to have a flowering bush instead, without the benefit of climbing in a tall trellis? Will it flower and thrive in the shade rather than in full sun? These are just a few questions that I'm willing to answer with experiments on the remaining T.grandiflora vines. 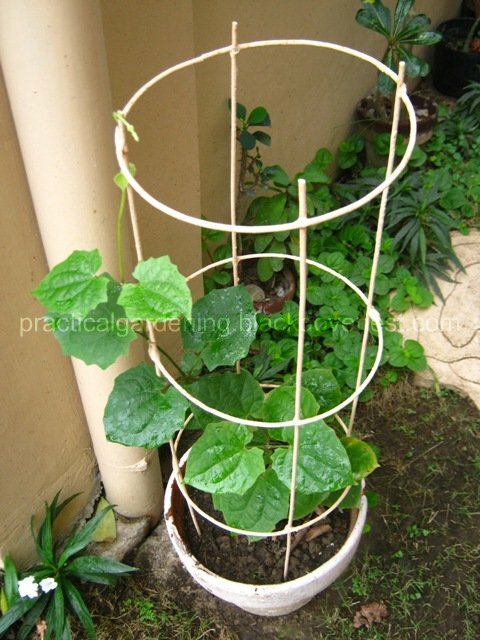 This is an experiment on growing the vine in a medium-sized (9-inch diameter) garden pot with a low (20-inch high trellis). I intend to keep the vine bushy by pinching and cutting off tips as often as possible. The small trellis will be there mainly as a support cage for the bushy vine. The vine grows fast so I need the discipline to monitor it's growth and trim it practically everyday - something akin to cultivating a bonsai. Here's one of the young vines that I replanted in the pot and has started climbing the low trellis. Wall-mounted trellises, especially wire trellises, are what I'm adept in making. So I've assembled a wall trellis for the rest of the young T.grandiflora vines. I just lined the young vines under the trellis and most are tall enough to reach the bottom wire. For the shorter ones, I just staked temporary bamboo sticks to train them until they're ready to start twining on the garden trellis.